The initial response to Apple’s new line of ‘Genius’ ads, debuted during the Olympic opening ceremonies, has been less than positive among the enthusiast community at large. Many Mac users and commentators were quick to decry the ads as a departure from the company’s crisp, snappy ads that have focused on the products it sells. But the spots are actually targeted very well, with a message that should resonate with the most important audience for Apple ads: those who are not already customers. It’s the execution of that message which falls short. Simplistic responses to the new ads abound. The technically proficient think that they’re simplistic and make Mac users look like idiots. The pro-consumer pundits cry “they’re for regular people!” And basically everyone on Twitter has turned into a freelance marketing expert. But, as is almost always the case, the truth of the matter lies somewhere in between black and white. The simple fact of the matter is that, by a vast number, the majority of the people buying computers are not buying Macs. That number has risen steadily over the last few years. The company sold 2% more Macs in the three-month period just ended than the year-ago quarter, marking its best June quarter ever for Mac sales…and it still only sold 4 million Macs. 4 million isn’t shabby, but Apple is still only hovering at around 5% worldwide market share for PCs, and doing slightly better in its home country with 10% market share in the U.S.
There’s a huge amount of the market yet to be conquered, and Apple knows this. That’s why these ads are pointed messages to potential new customers. They go after the segment of the market that will feel comforted by the fact that there is a massive retail presence at the ready should they need help. Apple is finally promoting the massive advantages that its 360+ retail stores offer it over the competition in its advertising. 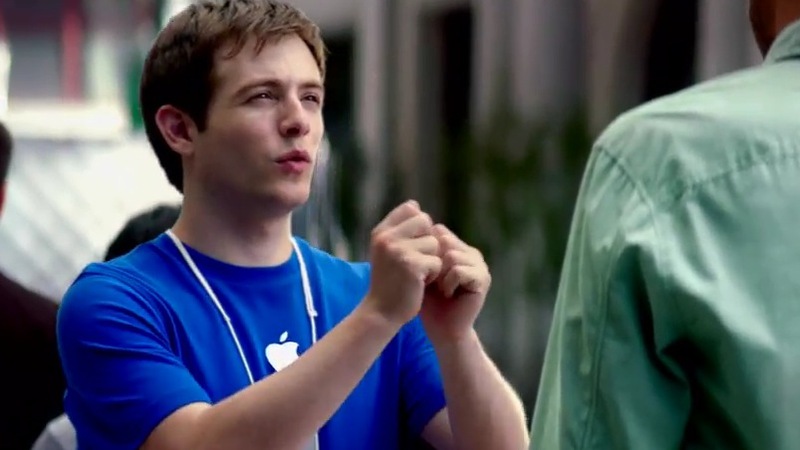 It’s stunning, actually, that it has taken this long for it to use the ‘Apple Genius’ as a marketing tool in TV ads. I wouldn’t be surprised to see future ads more directly reference the stores. While the Mac business may be almost vestigial when compared iOS devices, there is still solid and continuous growth there, and much of Apple’s strategy lately has been to capitalize on that. I mean, Mountain Lion is an entire operating system designed to leverage the good will people feel towards their iPhones and iPads in order to sell more Macs. Apple isn’t ready to stop selling Macs, and the sales numbers say that more people than ever are switching. So ads that attempt to make switching more attractive will be a big part of Apple’s marketing for some time, as it has been in the past. The first spot is Mayday, in which an Apple Genius on an airplane is called upon to assist a passenger in using iMovie to create a finished movie, which they do in around 25 minutes. Notably, the amount of time it takes to render the project isn’t mentioned. This seems fairly accurate, as you can easily cut together a movie in that time, provided you’re not overly concerned with editing. The Genius is then called away to help someone with a Keynote presentation with two minutes left until landing. The first passenger is now so enthusiastic he follows the Genius to help. This is also the only of the three ads that actually features an Apple product: a MacBook Air and is also easily the most effective of the three. I believe that this ad strikes the right tone on several levels. The Genius is willing to help, even if it is in a somewhat ludicrous scenario, and the demands (a Keynote presentation, a movie for the family) are logical and focus both on business and consumer needs of Mac customers. Unfortunately, the other two spots aren’t nearly as trouble free. The next is Labor Day, which features a frantic husband whose wife is in labor, knocking on a Genius’s door to get help making a photo card announcement for the birth. The whole setup feels stupid on the most basic human levels. Note that the man is already a Mac owner, like the one above, and his priorities are clearly screwed up. The Genius also sleeps in his shirt and keeps his badge on his nightstand, putting it on before answering the door at 4am. There are some nice touches here, like the bike in the Genius’ hallway indicating that he likely bikes to work. But the Mac owner is clearly a simpleton who puts computer help ahead of his own laboring wife and apparently can’t operate a phone. And why is he taking a random Apple employee along to the hospital? The ad is focused on Apple’s physical goods products, which…isn’t exactly a banner business for the company. The cards and books are ok, but using them as a poster child for Macs seems silly at best. The third, Basically, is the one that’s most clearly aimed at switchers, and should be the easiest to nail. It’s a simple message: No matter how much something looks like a Mac, if it can’t run the apps, it’s not a Mac. This is clearly aimed at the increasingly large Ultrabook market. The bag is small, about the size of a MacBook Air box, and could contain any number of the 11-13″ computers put out by other manufacturers to compete with the Air. Some of these computers mimic the Airs so closely that it may be hard for consumers to tell the difference. The problem is that the Genius comes off smarmy, not sympathetic. I mean, what is that praying mantis move he does? The script comes from a place of superiority and condescension, something that Apple users are accused of regularly. It’s not just Geniuses, though.This is also a common complaint about any young, technically savvy computer user when it comes to explaining things they feel should be obvious to novices. Think about the last time you explained a computer issue to someone with limited knowledge, how was your patience level? It’s not easy to configure yourself to be patient and empathic when dealing with people who are less technically savvy. But it’s the job of many retail workers, and should be the special focus of a Genius, who Apple is touting as a helping hand and even a reason to buy a Mac. The attitude is familiar, but tired. An older Genius would probably have made this spot feel better, and certainly a less smarmy response to someone who clearly went shopping for a Mac in the first place, but then got shafted in the process. That’s absolutely the point, and he’s dead on about the fact that these spots don’t make it well because they’re, at the very least, implying that you must have assistance to use a Mac and its proprietary software. But these ads fail that point on more levels than just intimating that ‘computers are hard’. They make the experience of interacting with a Genius seem like it’s going to be just like that time you asked your teenager what was wrong with your email. How patient and understanding was he, was it the kind of customer service you’d switch operating systems and re-purchase all of your software for? I have my doubts, but Apple seems to think so.